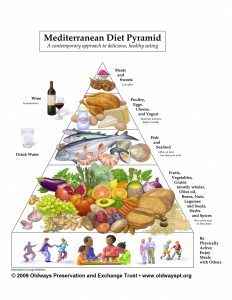 The Mediterranean diet is considered perhaps the healthiest way to eat in the whole world. Inspired by research on the dietary patterns of those who lived in Greece and the southern part of Italy in the 1940s and 1950s, the Mediterranean diet is based on fruits, vegetables, whole grains, fish, beans and even small servings of red wine. This style of eating offers health benefits for almost every part of the body, including the heart and brain. In this edition of Not Just Gluten Free, let’s take a culinary trip to learn about the nutritional benefits and flavors of these often naturally gluten-free foods, as well as practical suggestions for making your diet just a little more Mediterranean. Click below to learn about the numerous health benefits of the Mediterranean diet.